Korenwolf has an interesting comment on Monday. He claimed that the guy whose gear was criticized on a boost raid should have told "No problem, I'll take my gold to a raid group which is willing to boost me". He believes that "The power is with the boostees, they're the ones bringing the gold to the raid." This is not always true. It is true if drops will be sharded in his absence. This case he is putting 300G/item to the pot. However if the items are wanted by other people the situation is not that simple. Let's say that in his absence an item is sold for 300G minbid. In his presence, the same guy wins the item, but have to bid 1000G for it. This case 700G more gets to the pot, giving 70-70G extra profit to all the other 8 guys. However the original guy loses 630G. So, there are 8 guys who have 70G reason to support him and one guy who has 630G reason to make him leave. If there was a vote, he would be voted to stay inside. Oh wait there was a vote! Every member voted with his feet by joining a guild that has these rules. That's why the guild exists. However right there, right then there were 8 guys with little motivation to support him, and one guy with large motivation to make him leave. This is a common market problem: while the action is good for the whole, the gain is so little that the people don't care, while the few negatively affected do. Here comes the necessity for rules and enforcing agencies, to stop things that are bad for lot of people just a little. If my car is emitting too much CO and NOx, no person in the county are poisoned enough to personally sue me. On the other hand not fixing my car saves me $500, so I won't. But the National Traffic Agency forces me to get my car checked every second year and takes its license plate if it has bad emissions, making me to fix it. The perfect example is the 2008 depression: whenever a banker repacked a bunch of crap papers and insured them and repacked the insurance too and sold it to several investment funds, he made lot of money, while harming no single individual. He increased the risk of everyone by a tiny little bit. You know how that story ended, right? It's interesting to note that both your examples (your car and repackaged dodgy home loans) are both examples of the masses being impacted NEGATIVELY rather than POSITIVELY, as in the case of the boost raid. @Squishalot: that's irrelevant. The point is that many people has little reason to support the global optimum while a few has a strong reason to oppose it. In these cases the market solution can be different from the optimum. @ Gevlon: What would you call the 'market optimum' in any of those three scenarios? GDKP runs, by definition, are market neutral, for example. For all runs the optimal loot distribution is "all loot to the one uses it best". All loot distributions want to achieve it some way. The two cases (guy gets it for 300 or 1000) are market neutral. However "K gets the item because he would use it better than the guy" is a new option and has the perspective of being better. This is why systems need a balance of power. You need a leader who makes decisions for the overall good, and minions need some power, who will always choose in their own best interest. If the leader has too much power(cannot be replaced), he makes decisions for his own interests instead of the overall good. You see this in many African countries where the country is impoverished but the leader lives in a luxurious palace. If the minions have too much power, they choose policies which make their life too easy, which is the problem in the United States. The voters all want lower taxes for themselves despite the lowest taxes in the world and an enormous yearly budget deficit. So now we have liberals and conservatives arguing whether all or some should keep the Bush-era tax cuts for themselves, when the correct answer should be "none of the above". There is a saying that "Democracy is two wolves and a sheep voting on what is for dinner". This is why the wolves and sheep need a leader to set policy and have veto power. And every so often there has to be new elections so that the wolves are always worried they will be the sheep next time. The question is whether "K" was a sheep that was eaten by the wolves, the answer is obviously not because he left of his own choice. I don't see how this fits with your philosophy on social democracy ? Whilst the idea in this post is good, help everyone a little not individuals a lot, it seems to contradict the goblin principles you espouse - Selfishly be better than everyone else. @ Gevlon: "However "K gets the item because he would use it better than the guy" is a new option and has the perspective of being better." It's also a subjective option, whose measure of being 'better' is based on opinions of utility. Suppose K doesn't play as much as 'other', and so is willing to pay more (less opportunities to get the loot), but will use it less (overall less benefit derived from the loot). My point is, there isn't a market optimal position in the case of loot distribution. On the flip side, you can measure the risk that a bank undertakes, or the cost of pollution, objectively, even if people will have subjective measures of their value. @ yaggle remember the second half of that quote of yours : "Democracy is two wolves and a sheep voting on what is for dinner" Liberty is a well armed lamb contesting the result. Gevlons argument in the cae of "K" is the well armed lamb DIDNT fight. He fled over the border to mexico. ANDY ANDY Arribaaaaa. I see that now. But is that what goblinism is about? I would say being a goblin is to use whatever methods to improve one's situation. There are cases where "cooperate" is better. But there will be cases where "cheat" turns out superior. Well that´s all about gain/efford, we had that at the BG and prisoner's dilemma. The scary thing is that "K" also deflected in a situation where he could only loose by deflecting (had that discussion already). The only adding componence is that you can´t be shure of the actual amount of gain in that scenario, it depends on the bosses drop and the member´s wealth or investment cap. Thanks, I think I can just about reconcile what seems like a contradiction by using your definition but it does beg the question what exactly is Goblinism (perhaps of topic for this thread). It's Andale rather than Andy but that did make me smile. Who's Andy ? How do you know that players going on a boost raid have the cash to make bids? There are advantages of going on a boost raid to get achievements , rep and experience not just the items. So how do you prevent someone joining for a free ride? A lack of items/enchants/good gems could indicate a player without gold. And surely the market would decide to kick a poor player over a richer player thats how capitalism works. @Bobbins. You can make people show you enough cash to make reasonable bids (say 5k) in order to be allowed into the raid without appropriate gear, and this is normal for the few pug GDKP raids I've seen ("must have 5k gs or show 5k gold"). But of course you can't make them bid it. Note that a 'boost raid' as far as the PuG is concerned isn't 'give me gear', it's merely 'I'm not pulling my weight'. Boosted people don't need to buy gear, they can pay for achievement, essentially, or run in the hopes that their share of the loot > cost of being boosted. I don't get people sometimes. It is as if so many think they are special snowflakes and the rules don't apply to them. Or don't take the time to read them...or even to the ignorant ones, who get word of mouth, "Go join the PuG." So they talk like meatsticks, they way they would anywhere else and get denied...and suddenly you are racist...or hitler, or evil. "Suit my needs or you are trash." is the mindset, it has really become bothersome in the game. The morons want a free ride and if they can't get it from you they will try and pull down. I'll never comprehend the motivation of it, at least it is often entertainment. "must have 5k gs or show 5k gold"
could we all consider using not a GS-measurement in general terms, but average itemlevel proper enchanted and gemmed, as used by serious gear-comarement addons as eletistgroup? I really do not see the point of discussing this for so long. The person didn't leave because he was kicked from a raid or anything like that, he left because he was somehow offended. He expected the Pug to be a perfect place where everyone is accepted and was faced with the reality that no one can control what people say and that morons exist everywhere. Actions didn't hurt him, words did, which means he is the one that has issues. @Nikola Begedin: GS isn't the perfect tool for comparing people's gear, that's true. @Canttouchme: By using eletistgroup I get also enchantments and gemming rated, also if pvp items are used (fast raidoverlook). And there is no more efford for you using it, except for ignorance and "old habits" if you want to get an easy overlook on the equipment of someone. "Taking gems/enchants/skills in consideration is hard to achieve and you'll just have to trust that the guy with 6k GS actually has his gear the way it should be"
Yes and there are no spirit gemming Mages intellect gemming DKs or haste gemming prots or ungemmed / unenchanted anyhing? To trust someone I meet on the "street" is simply stupid. And by this all is known to M&S or leechers the addon works for them and is useless. Also I think GS discussion is not recommendet here, because undergeared already cleared out that GS/Gear means nothing in WotLK (also mentioning GS is forbidden in the guild rules of the PuG). I´m almost sorry adding my comment about not using GS but I want to vomit every time I read "xxxxGS for..."
Don't get me wrong, I'm not a huge GS-fan myself. But that doesn't mean it's a useless addon. If my GM would tell me to stop using it, I would, since the gain from the addon is only slight. But I am not in the PuG. Therefor i decide to keep it on in case its needed, and once in a while it actually is. However, some people organize and raid with quite a lot of groups, and as the leader of one of those groups, it's the best way to make a selection of which players you take with you, and which you don't. His maximum and minimum performance is higher. Let's just say he's a dps: With 6k GS pvp gear, no enchant. no gems and on autoattack, he will probably still do 2k dps. His maximum dps (pve gear,gems etc...) will probably be way over 10k. At the same time the guy with 3.5k GS will have a maximum dps of let's say 4-5k, and a minimum dps of below 1k. You're second paragraph is not quite correct, due to the 33%/66% rule you introduced. With 300g bid everyone gets 30g (or 9 get 270g together). With a 1000g bid, 8 get 66g each, 1 gets 66g + 333g. End result is, that 8 have 36g reason to support him. And one loses 206g (= 840-270-333; accounting for his 10% share; he gains 333g extra as second highest bidder; and he's clearly only willing to pay 900g for the item). So all else being equal, it's a 82g profit for the group. However, if he causes even a single Wipe (assuming it doesnt fall under the 300g payment/wipe rule), it's bad to let him stay. "I just noticed a lot of people complaining about the GS addon, but praising ilvl, while it's actually the same thing"
Comparing Ilvl with the enchant 0-100%, gemming 0-100% and equip 0-100% efficiency is NOT the same as GS. minimum dps of a 6k GS is zero. because he is afk. autohitting minimum dps depends on class, a autohitting walock with a dagger is quiet at 200-300 dps. If you want to say that eletistgroup and GS is the same I assume you are unable to read or to understand the english language. I´m not a fan of any gear-measurement but somebody who puts in his gems AND enchants correct has at least more knowlege of his class than the crap-socket 6k GS guy and will do more damage / cause less trouble even if he has 3k GS at this filthy addon. 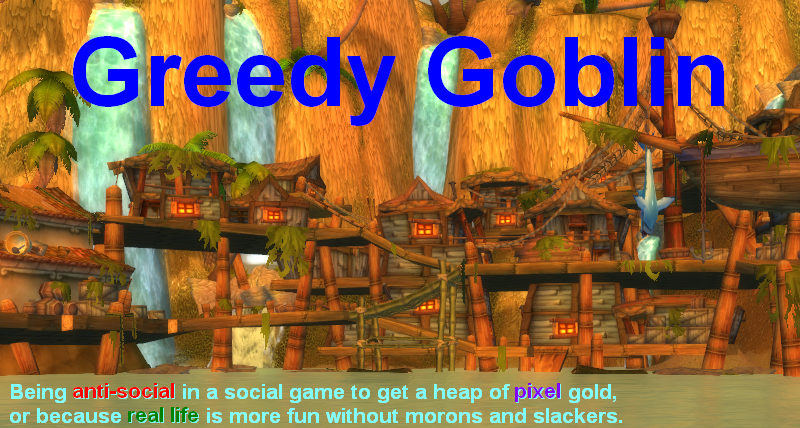 I'd like to propose a corollary to Godwin's law that states "Any discussion on the Greedy Goblin thread, as it grows longer, will inevitably lead to the mentioning of gear score"
We could call it the Gevlon-Godwin corollary. While it is fashionable to dump on the financial institutions - who did display massive amounts of incompetence - there is nothing wrong with high risk loans or packaging them. The mistake is when people believe or are mislead into thinking they are low risk loans. Nothing wrong with a "sub-prime" market where the premiums match the risk. A better analogy might be tariffs: if sugar is prevented from coming into the US or rice into Japan or ..., then each consumer is hurt a little and a few corporations benefit greatly. As do the political organizations they support. I.e., it is not "the market" that is favoring the few over the many, it is the few benefitting from having the power to prevent there being a free market as long as the many do not pay too high or visible a price. While many of the readers of this blog agree that verbally insulting someone *should* not cause the recipient to feel hurt, it is true that in the general populace, it will to varying degrees cause the recipient to feel bad and perhaps effect performance. If before each boss pull you whispered each participant and told them they were an idiot and played badly, do you think it would help or hinder raid performance? As a realist, I care far more about how people behave, not how they should behave. because what someone does is what changes the world, not what they could or should have done. And The PuG has rules and the story was people were not following them and there seems to have been no effective mechanism in place for enforcement. So K could say that this was just a special circumstance and persevered within PuG or he could have fought it. "I saw people behaving in a way that hurts group performance, there is no effective mechanism to prevent it so while I could stay, this is a game with tiny consequences for changing and my analysis is that the risk/reward favors finding another guild." @ anonymous mentioning the second paragraph: You make 2 mistakes. 687 gain - 664 lost = 23g gain for group not 82. The gain comes from rounding while splitting the pot. The pot is not always divisible by the number of players. @Anon: your "23 net" is nothing but a round off error artificially inflated by rounding 66.6667 gold to 66 gold, etc. Off course it isn't altered by adding boosters to the calculation. However, the presence of boosters could affect the "how much gold in my pocket at the end of the day?" calculation, since the pot will run out at a different points if go for min bid (or sharded) than if the bidding goes to 1k. And how does coming in second in the bidding make you a "leech"? Rather a harsh term for someone actively engaged in the process. This is a very common problem. It is called "rational apathy" I actually touch upon the subject in my bachelor thesis on signalling in illegal markets. This is also why corporate governance in corporations through small time stockholders fails. They simply cannot impose the checks and balances on management because their reward is so slim and the effort so large. This way, principle/agent problems like bad management are allowed to persist. I would love to hear what you think about this guy. He clearly invokes a goblinish spirit while other companies act "social" in that they want satisfied customers. It would be interesting to know what your opinion of his business model is! @309blank: I usually just delete offtopic but the linked article is just cute. This Mr Borker is a typical intelligent psychopath. His plan is simply masterful: getting better google position by making people write hate. However he made the standard psychopath-mistake, the one that separate small-time scammers from true goblins: he couldn't tell the difference between morons and not. There ARE some people, anti-socials, more intelligent socials and obcessive-compulsive types who fight back. The proper action against them is let it go. When the customer did a chargeback with the bank, she proved to be a fighter. He should just forget it and accept the loss, sell the glasses to some loser. Scamming the bank, with the re-chargeback, making life threats were completely stupid as they both made Ms. Rodriguez more devoted to her crusade and also were basis of criminal investigation. His business was shut down, he was arrested, game over. Also, telling the truth to the newspaper guy was completely narcistic and pointless, he just provided evidence against himself. Moral of the story: psychopaths without serious studies in law, economics and psychology won't get further than small-time scammers. You know that if you actually inspect someone using /gs, it will also tell you just how ungemmed/unenchanted/misgeared they are. There is both a raw GS based solely on ilvl, and the modified, which subtracts points for missing gems, pvp gear, and improper stats (dodge on a dps). So it does alot of what many people say need to be done anyways: check how competently they're geared for their role. So it is doing what a lot of people say needs to be done anyways. Just compare your modified GS, not your raw ones (of course that makes it much harder for people to flex their epeens).